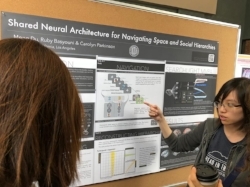 Yuchen Li presented her senior honors thesis project during UCLA's Undergraduate Research Week! 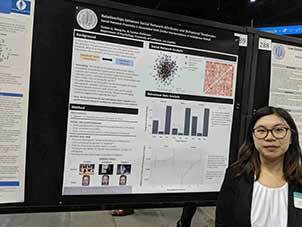 After graduating, Yuchen will move to Chicago to begin her Ph.D. in Dr. Karl Szpunar's UIC Memory Lab. Congratulations, Yuchen! The lab's research was also recognized with a Faculty Career Development Award from the UCLA Office of Equity, Diversity and Inclusion. 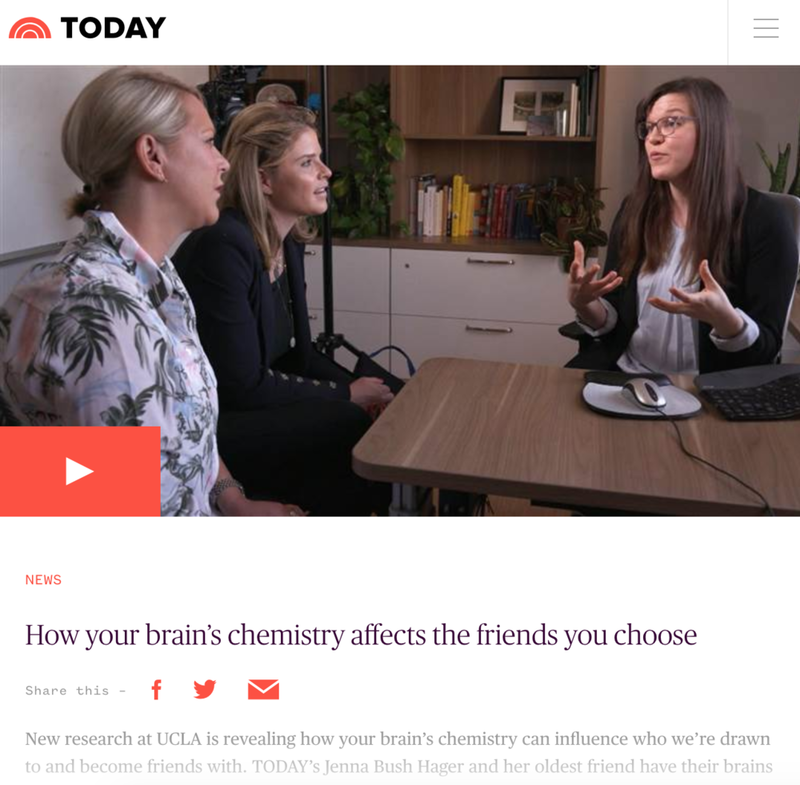 The Today Show visited the lab for a segment on neural similarity and friendship. You can view the piece on the NBC website or on YouTube. The lab welcomes John Andrew Chwe, currently visiting from NYU! 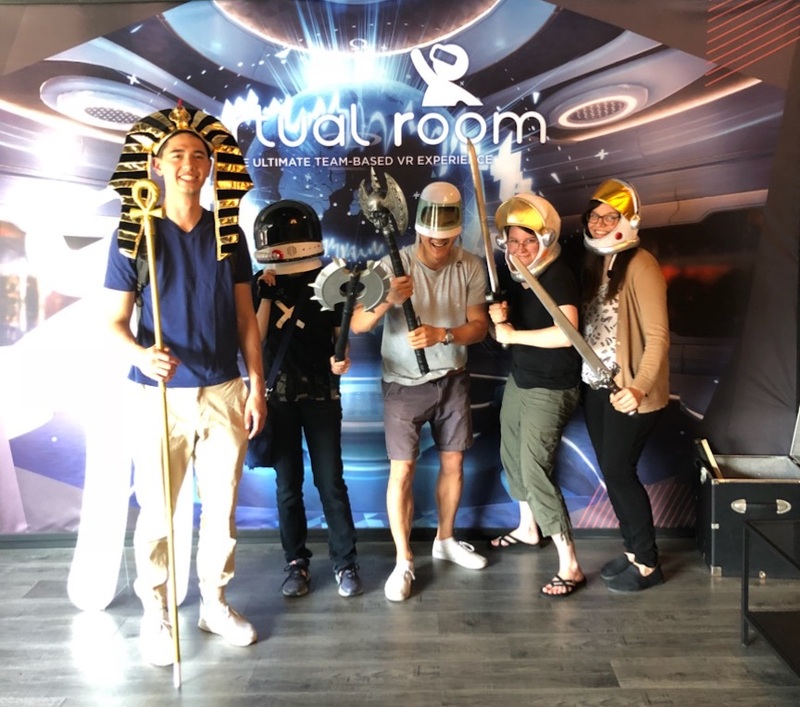 John Andrew and fellow lab members Meng Du, Ryan Hyon, Miriam Weaverdyck, and Carolyn Parkinson visited Virtual Room LA for a collaborative virtual reality experience where we were tasked with saving humanity from a rogue band of time-travelers. Saving the world is exhausting, so we celebrated with a delicious robata-style dinner. CSNL graduate student Miriam Weaverdyck was awarded a Graduate Summer Research Mentorship Award, was accepted to the 2018 São Paulo School of Advanced Science on Social and Affective Neuroscience, and had her first first-author paper from the lab accepted for publication! 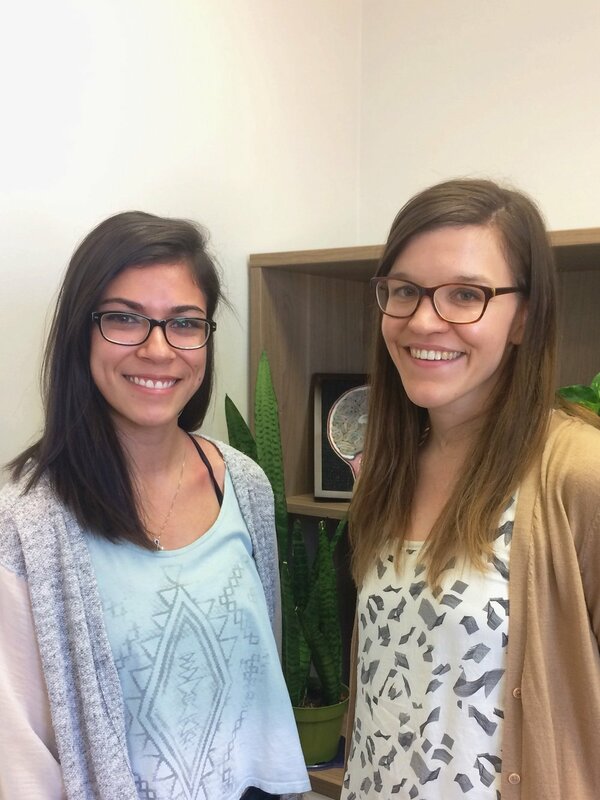 Recent research linking friendship and neural response similarity was featured in a piece by Lydia Denworth in Psychology Today! Lab director Carolyn Parkinson was awarded a Faculty Research Grant from the UCLA Academic Senate’s Council on Research! Former lab manager Mary Decker recently accepted an offer to pursue her M.D. at Harvard Medical School! Carolyn was selected to receive the 2017-2018 UCLA Life Sciences Division Excellence Award for Outstanding Research Publication for her Nature Communications paper, Similar neural responses predict friendship. 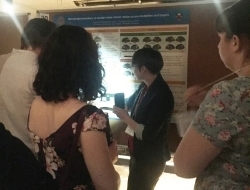 Miriam Weaverdyck, Ryan Hyon, and Meng Du traveled to Brooklyn, NY to present their work at the 2018 Social and Affective Neuroscience Society (SANS) meeting! Professor Parkinson was also voted by members of SANS to receive the SANS 2018 Innovation Award. 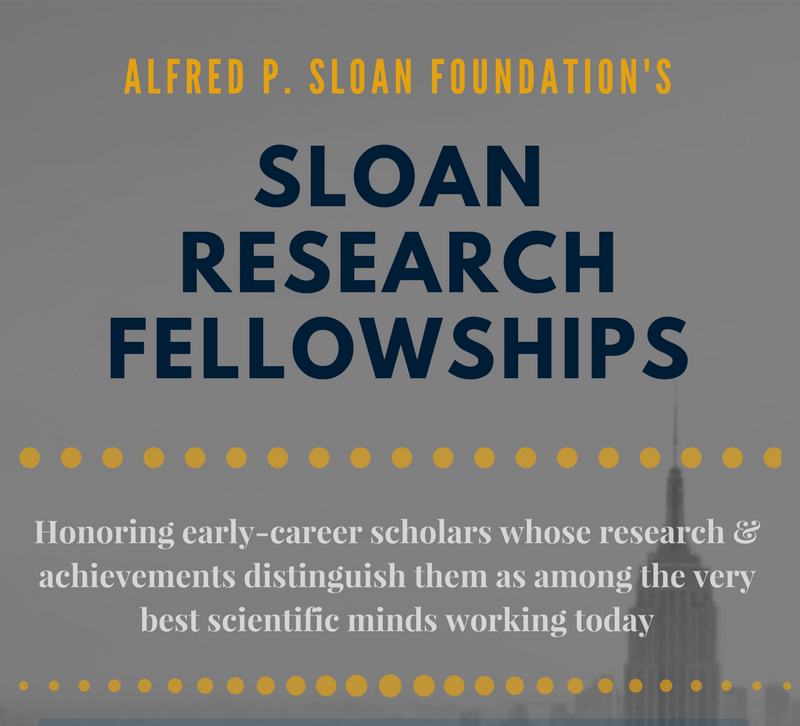 This award recognizes her work titled Spontaneous Neural Encoding of Social Network Position in Nature Human Behaviour as a publication that likely contributes to the discovery of new hypotheses, new phenomena, or new ways of thinking about social neuroscience! 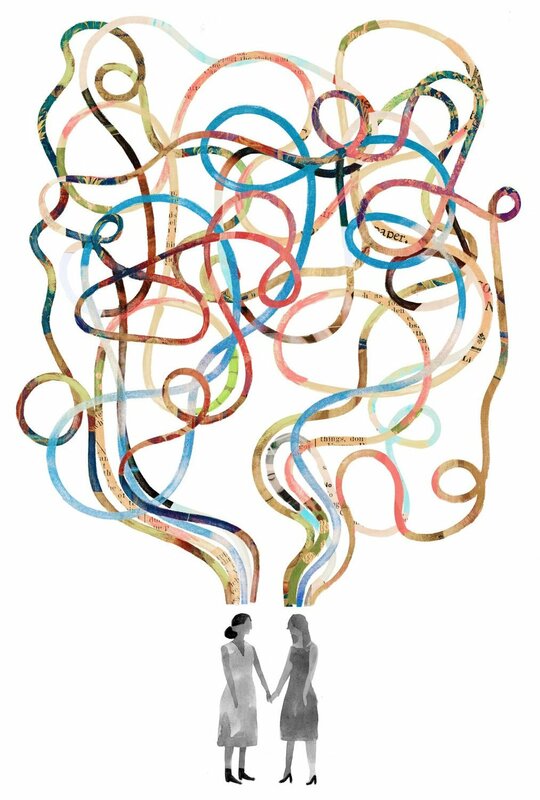 Recent research predicting friendship from neural response similarity was profiled in the New York Times in a piece by Natalie Angier. The piece was featured on the cover of this week’s Science Times section and was also selected for the newspaper’s educational Student Opinion feature. CSNL honors student Yuchen Li will attend University of Illinois at Chicago's (UIC) Cognitive Psychology Ph.D program beginning in Fall 2018. She will work under Professor Karl Szpunar in the UIC Memory Lab. CSNL research assistant Zeynep Gungor will pursue a Master of Science degree (MSc) in Organizational and Social Psychology at the London School of Economics beginning in Fall 2018. Congratulations to Yuchen and Zeynep, and we wish them the best in their future endeavors in psychology! New research linking friendship and neural responses to naturalistic stimuli is the focus of a ‘Spotlight’ article in Trends in Cognitive Sciences by Matthew Lieberman. 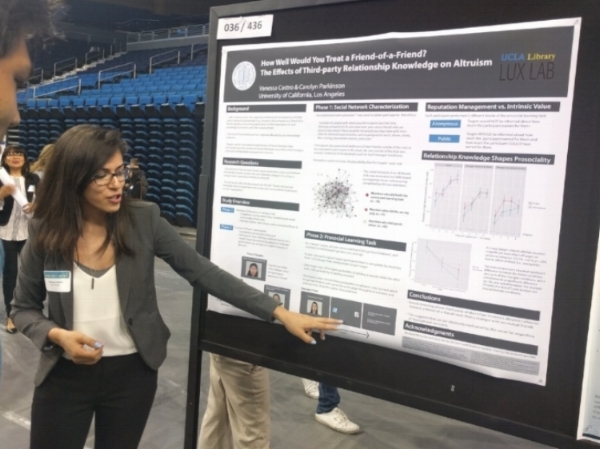 Recently published research linking social network proximity and similarity of neural responses to naturalistic stimuli was featured in media outlets including the LA Times, Newsweek, Pacific Standard, Vice, NPR, CBC, and Scientific American, as well as on YouTube's SciShow. New research published in Nature Communications demonstrates that people who are closer together in a social network process the world around them more similarly. For a complete list of CSNL publications, please see our Publications page. The lab welcomed our new lab manager, Ryan Hyon, and our new PhD student, Miriam Weaverdyck! In addition, Yuchen Li received a scholarship from the Undergraduate Research Scholars Program (URSP) for the 2017-2018 school year, which will support her senior Honors thesis in the lab. Congratulations, Yuchen! Recently published research on the neural encoding of social network position is the focus of a new 'Spotlight' article in Trends in Cognitive Sciences by Oriel FeldmanHall. Ruby Basyouni and Vanessa Castro both presented their CSNL research projects during UCLA’s Undergraduate Research Week. In addition, Vanessa Castro was awarded the Dean’s Prize for Outstanding Undergraduate Research in recognition of her excellent presentation of her Honors thesis research! The lab was also recently awarded a Faculty Research Grant by the UCLA Academic Senate’s Council on Research. A new article in Scientific American highlights our research on the neural encoding of social network position. 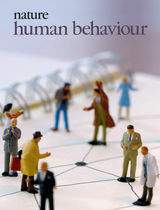 New research published in Nature Human Behaviour demonstrates that humans have accurate knowledge of where familiar individuals sit in our real-world social networks (e.g., how many 'degrees away' from us they are; the extent to which they're well-connected to well-connected others; the extent to which they bridge between different 'cliques') and spontaneously activate this knowledge when encountering one another. This work was highlighted in a News and Views piece in the journal by James Curley and Kevin Ochsner. A series of studies published in the April issue of Emotion suggests that similar patterns of bodily movement are used to convey similar emotions across remote cultures -- from a remote Kreung hill tribe in northeastern Cambodia, to a (slightly less) remote college town in the northeastern United States. CSNL honors student Vanessa Castro will attend UC Berkeley's Social-Personality Ph.D. program beginning in Fall 2017. She will work under Professor Serena Chen in the Self, Identity, and Relationships (SIR) Lab. We are thrilled about Vanessa's well-deserved acceptance and look forward to her continued contributions to social psychology. Congratulations, Vanessa! 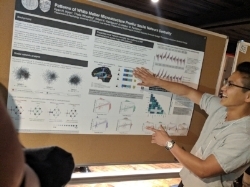 UCLA hosted the 10th annual meeting of the Social & Affective Neuroscience Society. Organizers Carolyn Parkinson, Jennifer Silvers, Naomi Eisenberger, and Matt Lieberman put together a program of events that brought together social brain scientists for debates, poster sessions, faculty & trainee talks, and symposia. Next year's conference will be held May 3-5 in Brooklyn, NY. CSNL lab members celebrated the end of the quarter with a hike up Temescal Canyon in the Santa Monica Mountains. A rainy morning gave way to a beautiful afternoon and we enjoyed the waterfalls, flowers, animals, and views along the trail. Being brain scientists, we were eager to ascend to Skull Rock where we relished vistas of West LA and the Palisades. We're looking forward to another term of research and excited about having our great RAs around for a few more months! The lab welcomes senior Ruby Basyouni as an undergraduate research assistant. Ruby has been admitted to the UCLA Psychology Research Opportunity Program (PROPS), which provides opportunities for undergraduates to begin their research careers and to acquire the needed experience for pursuing advanced studies in psychology. Working alongside Professor Parkinson, Ruby will be designing a study and collecting neuroimaging data. Lab members Taylor Pio, Mary Decker, Meng Du, Carolyn Parkinson, Yuchen Li, and Vanessa Castro (L-R) met at an escape room in Westwood to test their problem-solving and teamwork abilities. Each lab member contributed uniquely to the effort and the team managed to escape from the "Den of the Occult" with minutes to spare! CSNL honors student Vanessa Castro was admitted to the Undergraduate Research Scholars Program (URSP) for the 2016-2017 school year. The URSP scholarship is awarded to juniors and seniors who have a strong commitment to research and who are completing a comprehensive independent research project or a departmental honors thesis. Vanessa is also a member of the UCLA Psychology Departmental Honors Program and is working on her senior thesis with Professor Parkinson.